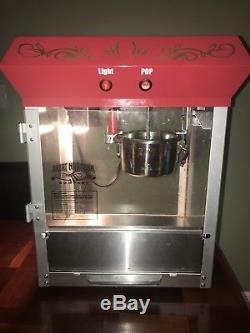 This is a used 4 ounce kettle popper only (no cart) The unit works and is in excellent shape. As shown in the photo, the knob on the kettle is missing. The item "Great Northern Popcorn GNP-800 All-Star Popcorn Popper Machine, Red" is in sale since Saturday, September 22, 2018. This item is in the category "Business & Industrial\Restaurant & Food Service\Vending & Tabletop Concessions\Tabletop Concession Machines\Popcorn". The seller is "court335" and is located in Mobile, Alabama. This item can be shipped to United States.